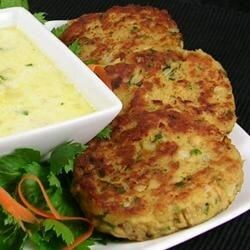 "Excellent recipe for canned or fresh salmon patties. This recipe is from the Oregon coast." Drain the salmon, reserving 3/4 cup of the liquid. Flake the meat. Melt butter in a large skillet over medium- high heat. Add onion, and cook until tender. Melt shortening in a large skillet over medium heat. Cook patties until browned, then carefully turn and brown on the other side.